As a kid I would have gotten bored after a few trials due to the delay. 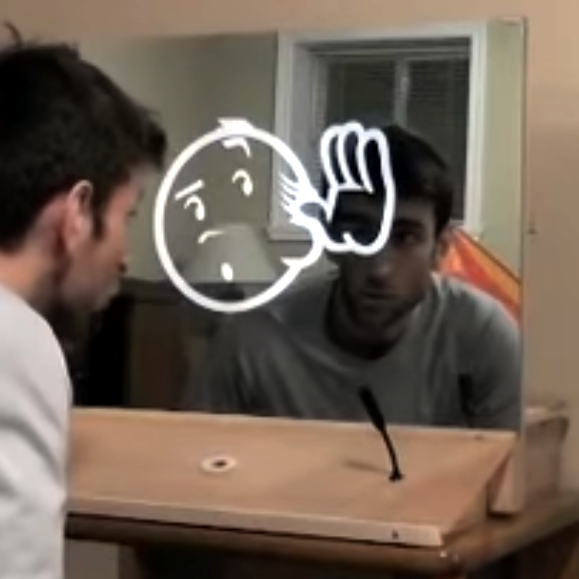 A “magic” mirror that needs several seconds to repeat a simple sentence would have sounded like a grown-up-toy to me (because grown-ups always need several seconds to understand simple sentences). video +33s. “Aimerais que tu écrive voiture” should be “Aimerais que tu écrives voiture”. This has been a team project completed over a week-end during the 2015 Wearhacks hackathon in Montreal. Although the magic mirror was via via my personal blog, I want to give credit to all persons involved at the time: Sébastien Cabot (initial idea), Kevin Vicrey, Pierre Voisin, Francois Cabrol, Marcial Lopez Ferrada, Medhi Aouami and myself Pascal Prado. GAWD, Guugles’ closed caption translation is atrocious! Interesting, but why bother with the very distracting buffering circle indicator? The responses appear to come back within a reasonable enough time that a blank screen ought to suffice until the display result is ready. The circle takes all the “magic” out if it and just advertises to the viewer there is a piece of regular tech behind the mirror, surely even a child would pick that up.